William Morrow Cookbooks, 9780062433039, 320pp. In her first cookbook, 100 Days of Real Food, Lisa Leake revealed how simple it is to think out of the box in the kitchen by replacing unhealthy prepackaged and processed foods with “real food”—mouthwatering meals made with wholesome and familiar ingredients. Now, Lisa is back with 100 quick-and-easy recipes and simple cheat sheets that will work with every family’s busy lifestyle. 100 Days of Real Food: Fast & Fabulous gives Lisa’s devoted fans and newcomers exactly what they want, quick and tasty favorites for breakfast, lunch, dinner, dessert, and even snacks that are a snap to make. Inside you’ll find recipes sure to please everyone, from Cinnamon Raisin Scones, Couscous and Tomato Salad, and Corn Muffins to Citrus Salad With Crispy Quinoa, Honeydew Green Smoothie, and Slow Cooker Black Bean Soup to Easy Fish Tacos, Parmesan Crusted Chicken, and Chocolate Banana Pops. While some dishes are blog favorites, seventy-five percent are brand new. 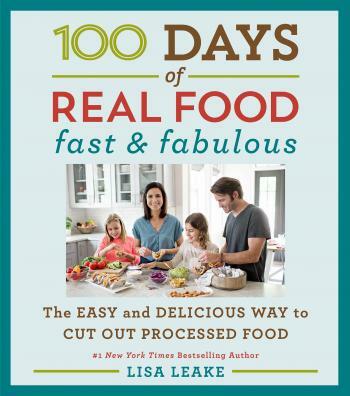 Along with these family-friendly recipes, 100 Days of Real Food: Fast & Fabulous incorporates ideas for adult, big-kid, and little-kid packed lunches and new seasonal meal plans and shopping lists—everything you need for accessible, quick, and real home cooking. Lisa also includes a “CliffsNotes”-style resource section packed with easy guidelines on how to buy real food, supermarket staples (including her Top 10 Shopping Lists by Store), the truth behind more than a dozen grocery store myths, and other handy kitchen tips (such as food prep guides and storage cheat sheets). Making and enjoying healthy meals the whole family will love doesn’t have to be difficult, boring, or expensive. With this essential cookbook, illustrated with color photos for every single recipe, you’ll see just how fast and fabulous good home-cooked meals can be.